Competitive gaming, or esports has been around as long as video games. 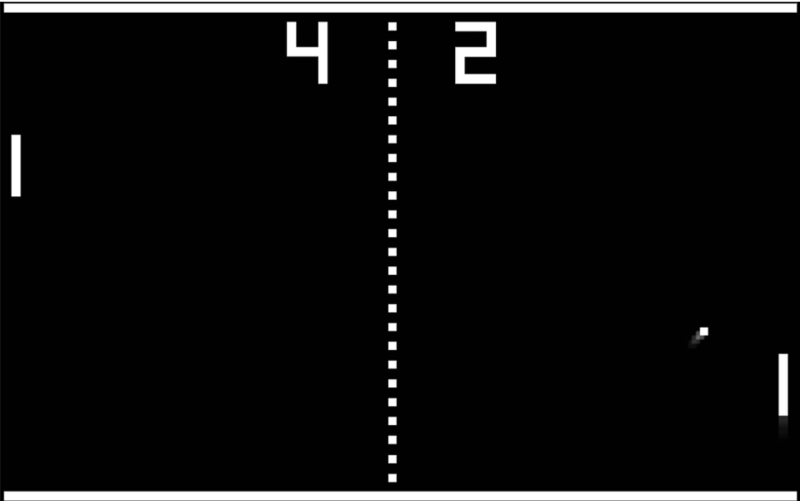 Since games like Tetris, Pong, and Space Invaders have hit the market throngs of people have visited arcades in the hopes of seeing their name and high score on one of the leaderboards. Without knowing, these early fans were heralds of a new competitive gaming generation. If someone had told them that in the future, people would be playing games in front of millions of people, and earning six figures while doing so, they’d have laughed, and jazz handed you out of the arcade. Fast-forward yourself to 2018. The DOTA 2 invitational prize pool came in at a staggering 25 Million USD. The Overwatch League finals brought in a combined 10 Million viewers, and the esports industry is projected to reach $1.5 Billion by 2020. Esports is no longer a niche that can only be experienced by a select few people. It’s now a global industry, that everyone can partake and enjoy in. Let’s dive into why. It is undeniable that the esports industry now occupies a significant sector in the entertainment industry. Over the past decade, the video game and esports industry has experienced a meteoric growth in terms of exposure, and revenue. 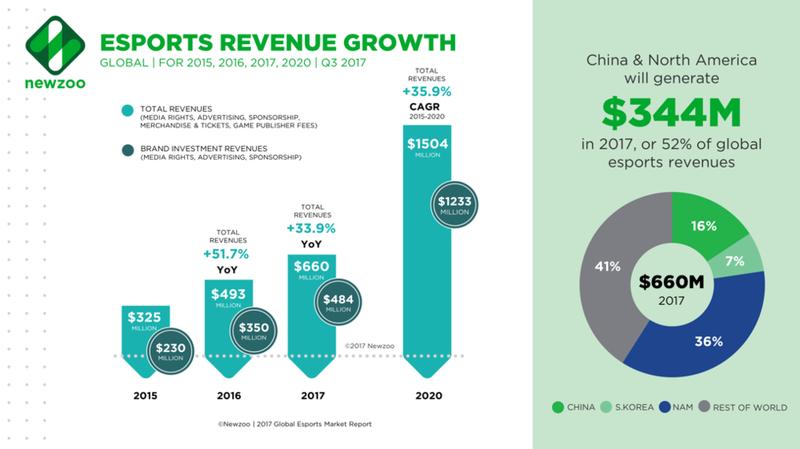 Newzoo’s esports report on revenue growth in the coming years. Research from Newzoo, a company which specializes it’s research on the esports industry has predicted that the esports industry will swell to $2.3 billion USD by 2022. From 2015, the esports industry has experienced a year-over-year growth of over 30 percent, with no sign of slowing down. T Investments from advertisers and brands like the Kraft Group, and Mercedes-Benz have been the primary leaders behind this growth. Large organisations have started to put their hands into the esports world, and over time, the number of organisations will only go up. The companies that have put their faith into esports range from a variety of different fields, ranging from beverage companies like Coca Cola, and Monster; Tech companies like Asus, and HTC; Major sports franchises have also begun to take a look at the profitability of esports, hoping to draw the attention of the gaming crowd. Furthermore, it has been shown time and time again that fans are willing to directly contribute to the esports industry. The DOTA 2 International is a prominent example of how fans can directly influence esports. The competition prize pool was set to crowdfunding, allowing players of DOTA 2 to purchase a Battle Pass that would send 25% of its revenue directly to the prize pool for the International. Starting at a base $1.6 Million, the audience of DOTA 2 grew this prize pool to $25 Million, the largest ever in esports history. The actions of the esports fan base often have a massive impact on how it performs, and currently, they are allowing esports to experience unprecedented growth. 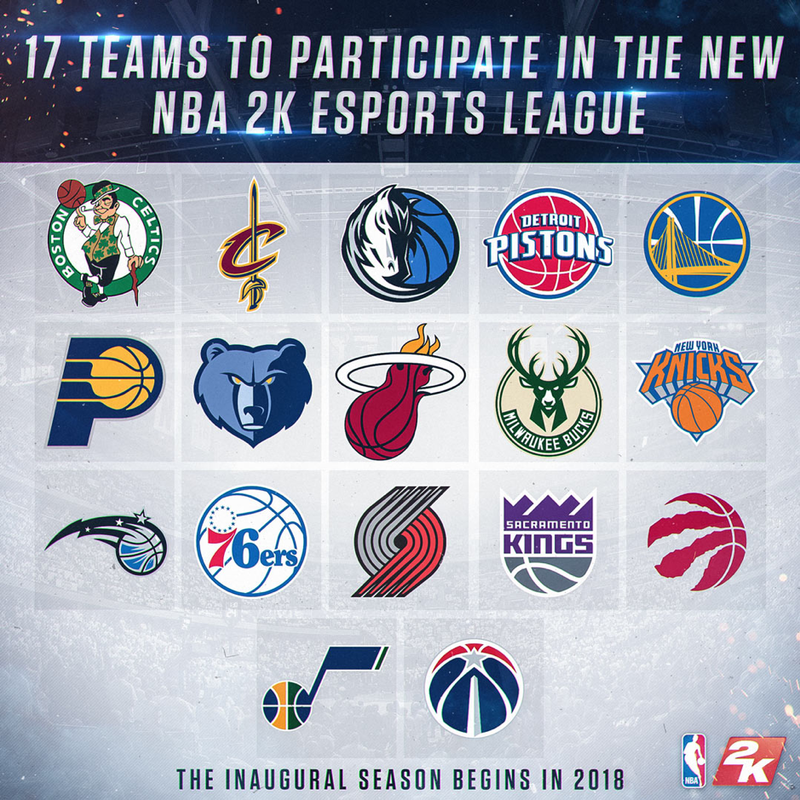 17 NBA teams are participating in the NBA 2K Esports League. Officially sponsored by the NBA, it’s a huge step for esports and it’s mingling with sports. The NBA is a prime example of how prominent sports franchises have put their hands into the esports industry. Modelled after the NBA itself, the NBA 2K League is an official competition, where the players get salaries, benefits, and retirement plans. They are drafted, and treated the same as NBA athletes are, with housing, food, transportation all covered by their team. Knicks Gaming recently won the inaugural championship, pocketing $300,000 USD in prize money to boot. The NBA blurs the line between traditional sports and esports, especially when it comes to treatment of their players. As the NBA continues to be an example of how the esports industry can co-exist and grow alongside the sports industry, other sports franchises will look, and attempt to adopt this strategy. Esports has already arrived, and it’ll only get more prominent as time goes on. Our current generations reliance on social media hasn’t always been a negative, but as gaming and competitive esports used to have a very negative connotation on TV and in movies, it’s been a hard barrier to overcome. Comedian Jimmy Kimmel famously derided gamers and esports athletes as strange, and received a great deal of internet backlash as a result. However, Kimmel is representative of the general attitude that many people possess when it comes to competitive gaming. Jimmy Kimmel isn’t the only person to dismiss gaming and the esports world as a whole. Colin Cowherd, a famous American sports media personality also derided esports, calling it, “for booger-eaters”. Both of these comments were made in 2015, and they weren’t received well then, and still aren’t received well now. Between then and 2018, a wave of celebrities have spoken out about their support for gaming and esports in general, turning general attitude towards the industry from negative to positive. Rick Fox, ex-NBA player is a noticeable example of someone staunchly defending esports. Fox famously legitimized gamers everywhere on ‘The View’, a popular talk show when he stated that he absolutely considered pro gamers to be professional athletes. Terry Crews, notable known for his TV show Brooklyn 99 and movie series The Expendables has shown vocal support for gaming, citing that it has helped him connect to his children. He’s most notably built a gaming computer with the help of his fans, livestreaming the building process on YouTube. It is incredibly important to influence how the general public perceives esports and gaming in general. Prominent celebrities and personalities are showing that gaming isn’t something shameful, or a niche thing that only certain people do. Their actions have, and will continue to help esports grow. Esports is already projected to become a billion dollar industry in the next couple of years, with viewership in 2017 already reaching 143 million. It’s estimated that more than 550 million people will be fans of esports in 2021. The impact that esports has had economically and culturally in the current generation is beyond a doubt. Investments from the sports, media, and various other industries continue to expand the economic potential of esports, with the audience also contributing to ensure that esports maintains a strong fanbase. Famous celebrities and influencers showing their support for competitive gaming and video games in general helps ensure the public accepts esports. The esports industry has come so far since the arcade days, yet the future remains bright.